Because I own a car in Chile, I rarely find it necessary to rent one either here or in Argentina. 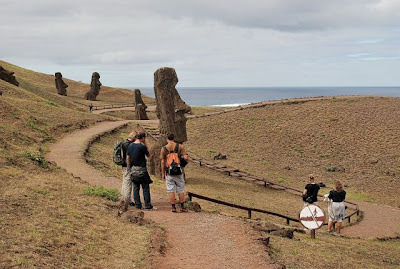 The main exception is Rapa Nui (Easter Island), as it’s hardly practical to ship my own vehicle more than 3,700 km – that’s the distance from the northern city of Caldera, the nearest point on the Chilean mainland - from the port of Valparaíso on a quarterly supply ship. Of course, Rapa Nui isn’t very big, only about 171 sq km (roughly 66 square miles), but it’s just big enough that walking around the village of Hanga Roa and getting out to see its monumental archaeological sites is more time-consuming than most visitors expect. Given that I now spend most of my visits updating practical information in town, rather than seeing the sights per se, I rent a car when, as last Saturday, I take a semi-sightseeing day. For getting around Hanga Roa, many hotels have loaner or rental bikes, and several agencies along the main commercial street of Atamu Tekena offer rentals as well. 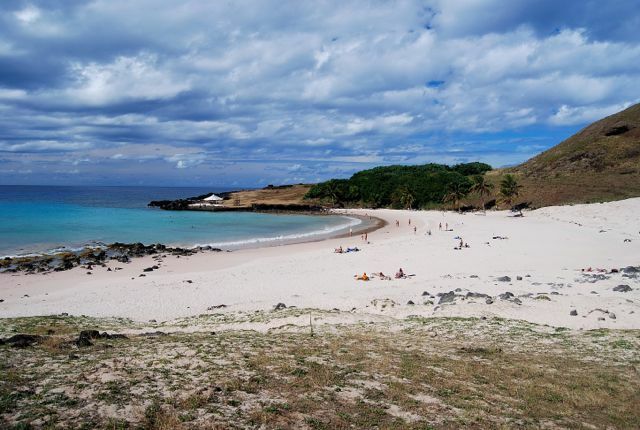 Strong mountain bikers can probably handle the main sightseeing loop from Hanga Roa east to Rano Raraku (pictured at top) and Ahu Tongariki, then northwest to Playa Anakena (pictured above) and back in a day, but should get an early start – there’s a lot to see. 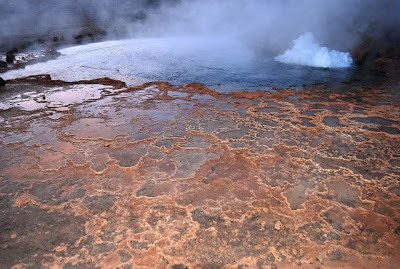 The climbs on that route are mostly gradual, but it’s imperative to carry water (though water may be available for sale at Rano Raraku and Anakena). 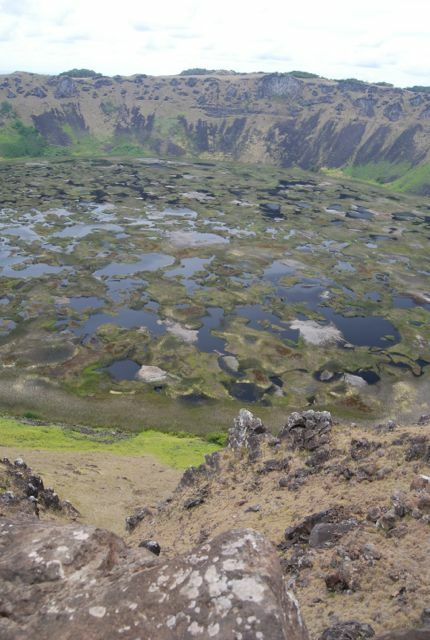 Cycling to the crater of Rano Kau (pictured above) and the Orongo ceremonial village (pictured below), just south of the village, means a steep climb from sea level to more than 400 meters (but a breezy ride down). I’ve usually taken a taxi (about US$6) there, and walked back along a footpath that offers spectacular ocean views and passes some seaside lava caves that one might otherwise miss. 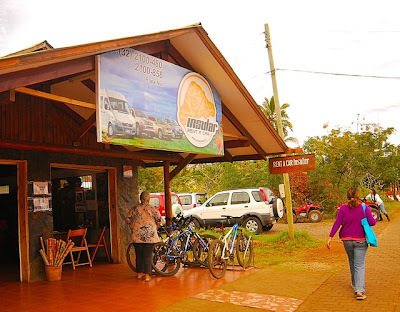 This time, to do the loop described above, I rented a car from Insular Rent A Car (pictured below) which, like other agencies in the village, also offers motorcycles and quadricycles. The first vehicle they gave me, though, had what felt like a dangerous shimmy as I left town, and I returned it slowly and exchanged it for another, better one. The explanation I got was that no place on the island is equipped to do front end alignments; fortunately, the second car was in better shape. It’s worth noting that no 4WD vehicles are available or even necessary – the main roads are not bad – but high clearance is still a good idea. Renting a car for the day cost me 30,000 pesos, about US$60 at the current exchange rate. In fact, the 24-hour rate was 35,000 pesos (about US$70), but I managed to negotiate the eight-hour rate for a period that took me from 10:30 a.m. to 8 p.m. This is possible in face-to-face negotiation, especially if you suggest you might go to the agency across the street, but if you call to have a vehicle delivered to your hotel, there’s not much room for discussion. There’s one big caveat about renting a car here – there is no such thing as collision insurance on the island so, if you wreck a car, you’re on your own. Agencies require a credit card deposit slip that they’ll tear up if you return the car in reasonable shape – they don’t inspect for dents the way, say, Hertz might. Most cars here have a few dings, and plenty of those are due to the feral horses that have virtually free run over the island. As a longtime Californian, I’ve lived through many earthquakes, including the 1989 event that disrupted baseball’s World Series, the so-called “Bay Bridge Series” in which my hometown Oakland Athletics obliterated the San Francisco Giants in four one-sided games. In retrospect, that name was something of a misnomer, as the quake knocked down part of the cantilever bridge between Oakland and San Francisco, forcing Athletics’ fans to find alternative routes from the East Bay. 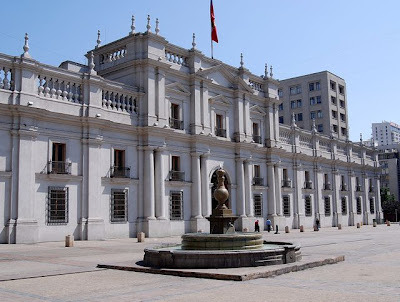 Never, though, had I experience a quake in a tall building as I did last Tuesday’s, on the ninth floor of the Hotel del Valle outside Santiago. Though there was no damage, the movement of the quake and especially its duration - at least two minutes - unnerved me briefly. I was not nearly so unnerved as Owen Betts, a young Falkland Islander who had never experienced a quake before. Owen, who is doing me the favor of carrying a copy of the new third edition of my Moon Patagonia guidebook to the Falkland Islands Tourist Board this weekend, sent me a text message around 2:30 a.m. from the beach town of Guanaqueros, near La Serena (pictured above), where he was enjoying a beach holiday. Immediately after the quake, he was having a hard time getting back to sleep and, after about an hour and half, he sent me a text message that I didn’t retrieve until the next morning, when I phoned him back. He figured as long as he could hear the surf crashing, he was OK, but that a prolonged silence would suggest the long wavelength of a tsunami had emptied the bay and was about to strike. 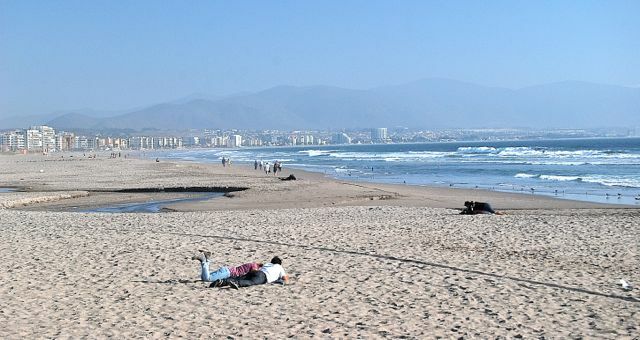 On La Serena’s long, sandy beaches, there are no obstacles to stop a tsunami from coming ashore, where it would shatter beachside businesses into toothpicks. As it happened, there was no tsunami, and Owen (whom I have never met in person, though I know his father George pretty well from the time I lived in the Falklands in 1986-7) was able to resume his vacation. 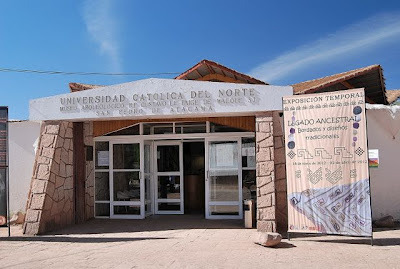 Incidentally, according to the Santiago daily La Tercera, the US Geological Survey downgraded the quake’s magnitude from 6.7 to 6.5; meanwhile, the Universidad de Chile’s Servicio Sismológico upgraded their estimate from 6.3 to 6.5, so everyone would seem to be in agreement. Those changes, though, are not reflected on the respective websites. Speaking of tsunamis, I’m presently in one of the most vulnerable tsunami sites in the world, the village of Hanga Roa (pictured above) on Chile’s remote Polynesian possession of Rapa Nui (Easter Island). 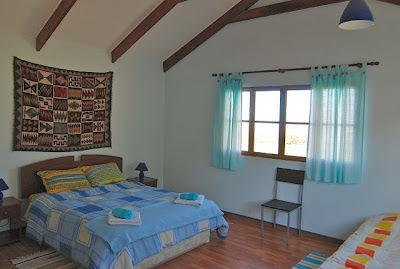 I’ve spent two nights at the utterly transformed Hanga Roa Ecovillage & Spa, but will spend the next two at the Puku Vai Hotel before returning to the Santiago and, next week, to California. 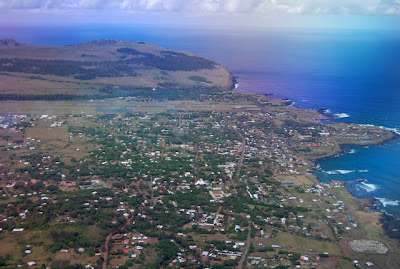 I will have more to say about my sixth lifetime visit to Easter Island in the near future. Some years ago, in northern Chile’s Pampa del Tamarugal, I awoke with a start when my truck – in whose camper shell I was sleeping – started shaking uncontrollably. As the vehicle bounced back and forth on its springs, I had the distinct feeling that someone was rocking it intentionally but, since I was the campground’s only inhabitant, I couldn’t imagine how that could be. Finally, shaking off my sleep, I realized it was a rolling earthquake. 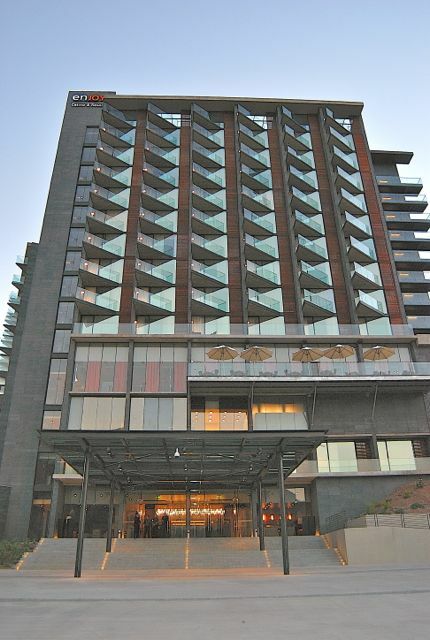 I had the same sensation at 12:50 a.m. this morning when, on the ninth floor of the new Hotel del Valle north of Santiago, the building (pictured above) started shaking and didn’t let up for nearly three minutes. According to the USGS, the cause was a magnitude 6.7 offshore quake about 42 km (26 miles) NNE of Valparaíso, about 80 km (50 miles) east of here. My heart was pumping fast and, perhaps because I was so agitated, I didn’t even notice the 5.1 aftershock only 13 minutes later, but finally got back to sleep. Santiago’s El Mercurio Online has more details, reporting that Chile’s own seismographic service ranked the quake as a 6.3. 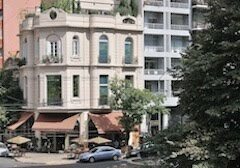 It clearly disturbed Chileans for whom the massive quake of February 2010 is too recent a memory, and many went into the streets out of worry that buildings might collapse. It was felt as far north as Copiapó, about 800 km from Santiago, and as far south as Concepción – one of the cities most affected in 2010 – about 500 km away. In coastal zones, some people fled to nearby hills to avoid a potential tsunami, though the government discounted any such likelihood. Here, having opened only nine months ago, the Hotel del Valle passed its first test with flying colors: a bottle of Cabernet placed precariously in my room appears not to have even moved. The Atacama has the reputation of being the world’s driest desert. 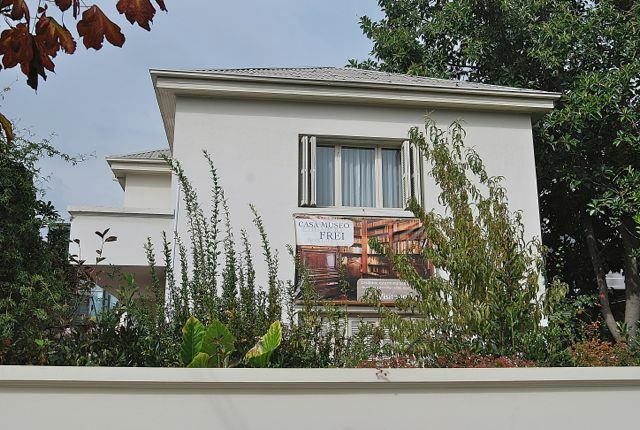 If I recall correctly – I don’t have access to my home library right now - the venerable South American Handbook once asserted that some weather stations in the region had never recorded any precipitation. Nevertheless, I recall hitchhiking once from Calama to San Pedro de Atacama in weather that turned from cloudy to near whiteout on the high plateau between the two localities. 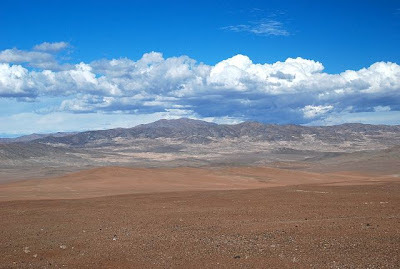 Still, it surprised me Thursday morning when, as I loaded the car for the long drive south toward Santiago, a solid cloud cover stopped any sunlight from filtering onto the desert floor. 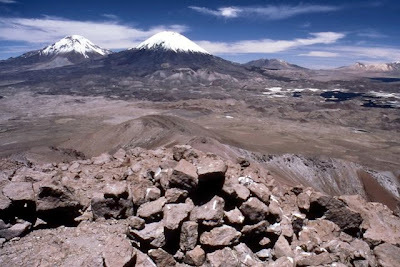 It wasn’t totally surprising, as the high peaks along the Bolivian border (pictured above) almost always sport some snow, and the area surrounding San Pedro had a wet summer that damaged backcountry roads. 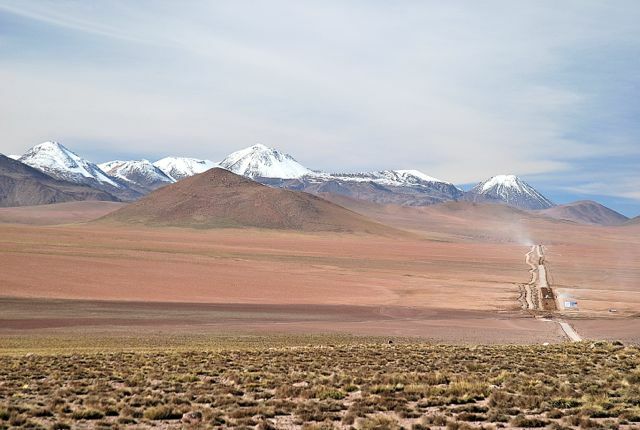 For the entire month of February, that kept the village’s travel agencies from offering excursions like the geysers at El Tatio. While it didn’t rain much in San Pedro proper, the runoff from the high country ate away at riverside roads near town, and even briefly isolated the Hotel Alto Atacama (pictured below), where I recently spent a couple nights. 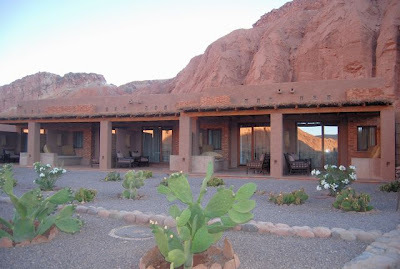 When I first drove from the four or five km from San Pedro to the Alto Atacama, there was one shallow river ford that posed no problems whatsoever. Two days later, though, there were four separate fords and, while I had no problems with my high-clearance vehicle, smaller cars were taking a high-speed head start to ensure getting across the water. While I doubt that was necessary in this instance, it’s not hard to imagine problems with increased runoff – anywhere in any desert, flash floods can cause fatal accidents. 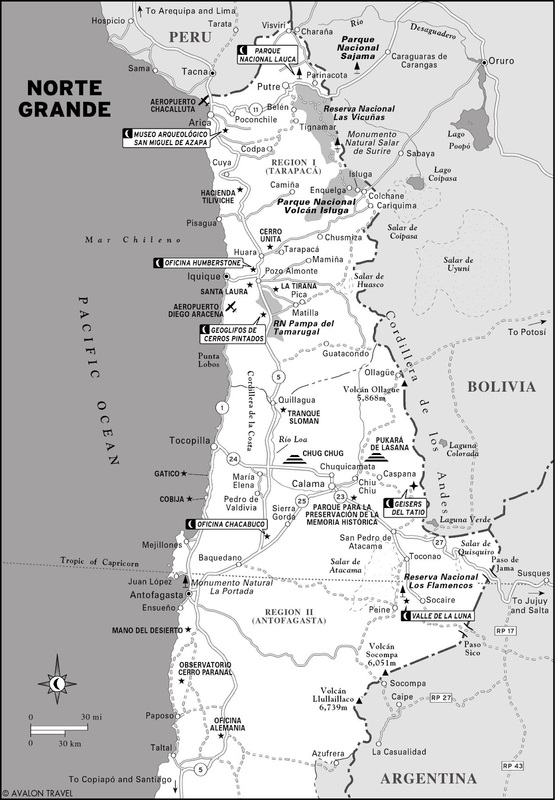 Driving west, toward Chile’s even more arid coastline, I expected the weather to clear, but I was wrong – between San Pedro and Calama, sprinkles wetted the windshield sufficiently that I had to use the wipers. 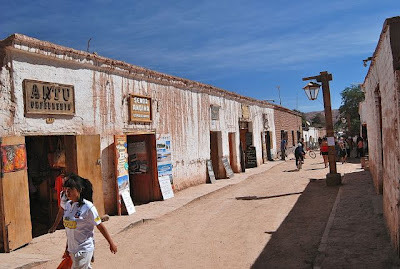 Between Calama and the nitrate ghost town of Oficina Chacabuco (pictured above) , where I stopped to update my photo library, I found fine spray from heavy mining trucks obscuring the view – a virtually unheard of occurrence here. 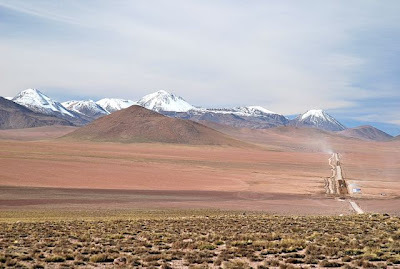 Only when I reached the coastal cordillera of the Sierra Vicuña Mackenna (pictured below) , near the Cerro Paranal observatory, did the skies clear noticeably, but even then there was lingering cloud cover. As nightfall approached and I arrived at the town of Bahía Inglesa - roughly 740 km (460 miles) from my starting point – the sprinkles started again. They let up, though, and I slept soundly after roughly 12 hours behind the wheel (including sightseeing breaks). When I awoke the next morning, though the sun was out, I found the car spotted with sprinkles and nearly surrounded by standing water that had flowed downhill toward the beach. 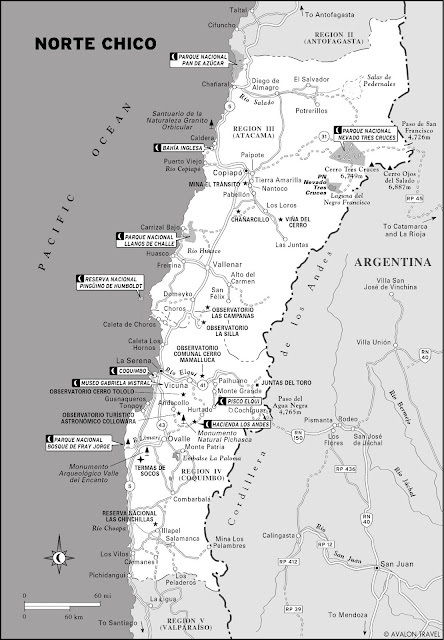 Instead of taking the new freeway east and south toward Copiapó, Vallenar and La Serena, I decided to take the coastal road south toward the port of Huasco and then east to Vallenar. It’s mostly a consolidated dirt surface but, given how quickly the desert absorbs or evaporates moisture, I never expected to find miles of standing water – small amounts, admittedly – and mud. 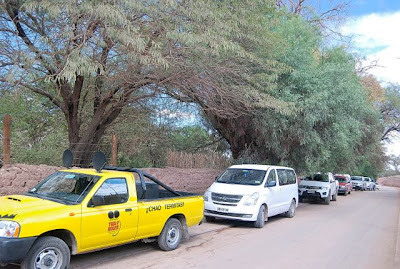 There were various crossings of the sandy bed of the Río Copiapó where, however, authorities have placed warning posts for various water levels – green means anyone can cross, yellow is for high-clearance vehicles, and red means nobody should even try. While I can’t say it was alarming, a bit of slipping and sliding got me to slow my speed and, when I arrived at Huasco for a fresh fish lunch, my 4WD was pretty dirty. I continued south to La Serena and the charming town of Vicuña, home to Chile’s major pisco producers and clear skies that make it home to both several astronomical observatories. It was another long day on the road, covering even a little more distance than I did the day before. Fittingly for the day, cloudy skies postponed an 8:30 p.m. visit to Mamalluca, where tourists go to see the southern constellations through professional telescopes, but an hour later the skies had cleared. 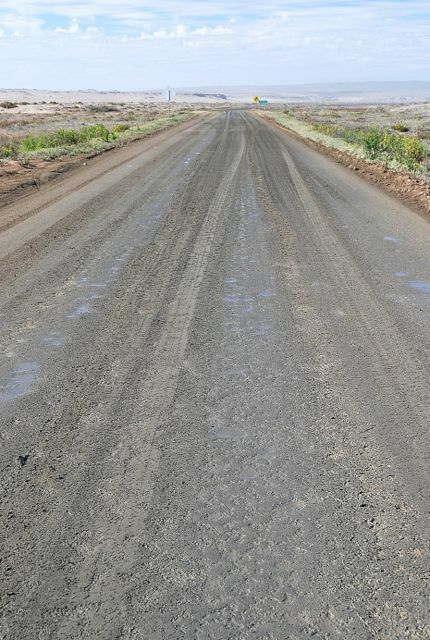 This morning, the mud was still falling off the flaps of my 4WD, a reminder that desert driving has its hazards. Thirty-some years ago, when I first visited San Pedro de Atacama (pictured above), it was a sleepy Atacameño village where the Belgian Jesuit priest Gustavo Le Paige worked quietly on archaeological artifacts from the surrounding countryside, in the museum that bears his name today. Most of the buildings were, and still are, low slung adobes whose few windows offer little insight into what goes on behind them – with the major exception of those that now host a critical mass of accommodations, restaurants and travel agencies that have made it the highest-profile destination between Santiago and the Peruvian border. At that time, San Pedro had only two accommodations options, though it now has nearly a hundred. 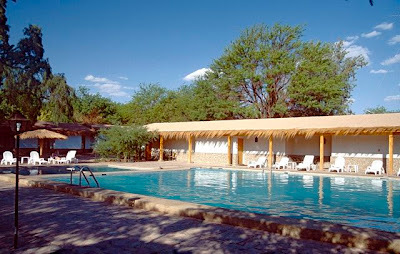 One was the basic Residencial Florida, where I stayed and ate – there were no proper restaurants except at the still-existent Hostería San Pedro (pictured above), a full-fledged hotel that was well beyond my then backpacker budget. The only other guest at the Florida, which also survives as Hostal Florida, was a Japanese backpacker with whom I could barely converse in my then halting Spanish. I visited the museum, where Father Le Paige shuffled through the aisles and the desiccated mummy popularly known as “Miss Chile” inhabited a glass display case. 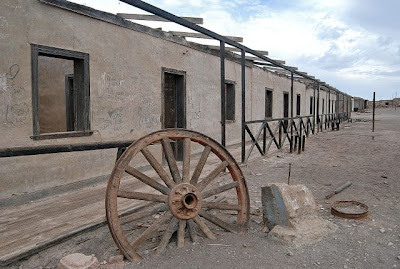 The San Pedro of 1979 had no traffic lights and little traffic of any kind – the local population could herd their sheep through the streets and into corrals behind the walls that extended from their houses. It still has no traffic lights but, in a development that some find annoying, it has increasingly strict parking laws and the Carabineros police are writing record numbers of tickets to locals and tourists alike. 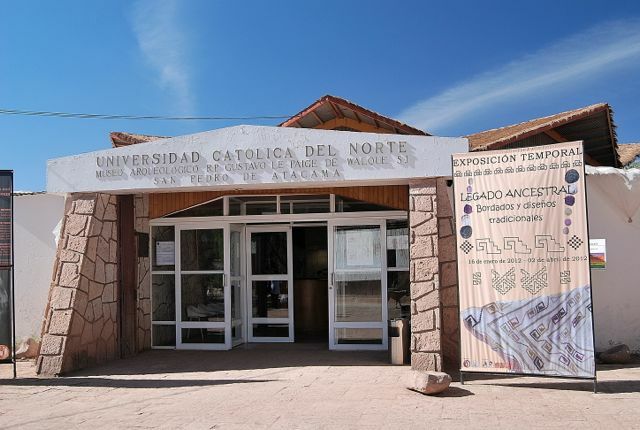 If you rent a car in the city of Calama, which has the nearest airport, watch for the no-parking signs here or you may find surprise charge on your credit card after you return home. According to the last census, in 2002, San Pedro’s population was only 1,938. A new census is due to take place shortly, and most educated guesses are that the new figure will exceed 5,000. 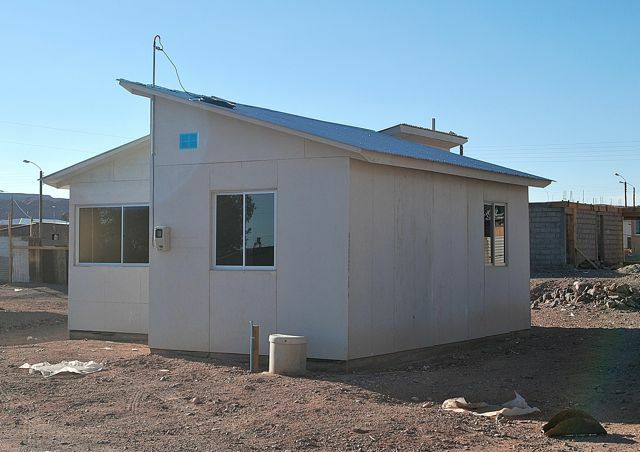 Growth has taken place not in the colonial core, but rather on the outskirts, where the new construction consists mostly of simple prefab mediaguas (one of which appears below). This is less than picturesque, but eminently practical for a growing population. The village sports a new soccer field, with artificial turf, and even an Olympic-size swimming pool. Meanwhile, in a country where spray-paint taggers leave their mark almost everywhere, historic San Pedro remains virtually graffiti-free. At the same time, even as a relatively tasteful commercialism prevails (as suggested below, graffiti is becoming more visible beyond the roughly 12 square blocks where many of the countless tourists sleep, eat and organize their excursions into the nearby high country. Speaking of excursions, there’s a new twist for those who take tours or head off on their own into the high country near the Bolivian border. Yesterday, when I went on a full-day trip to the famous geysers at El Tatio (pictured below), the Carabineros informed our driver and guide that from now on, all tour operators will be required to provide passport and ID numbers for all their clients, and that those clients will also have to carry identification. A clear photocopy of the passport will be sufficient. Yesterday, with some trepidation, I began the climb from sea-level at Arica – the last Chilean city south of the Peruvian border – to the Andean village of Putre (pictured above), the gateway to Parque Nacional Lauca (pictured below). This would be my first visit to Putre since in three years, and the altitude of 3,500 meters (11,482 feet) above sea level would be a test for both my bronchitis-ravaged lungs and for my aging Nissan Terrano, which suffered a blown head gasket last year. The Nissan, despite the nearly 250,000 km (150,000 miles) on the engine, passed with flying colors. In the 125 km from Arica, the temperature needle never reached halfway and, while it uses more fuel at these altitudes, it arrived with nary a glitch. I wish I could say the same of myself but, while most of my bronchitis symptoms have gone away, I have a relict cough, and I know my lungs aren’t yet at full capacity in the thin atmosphere of the high Andes. 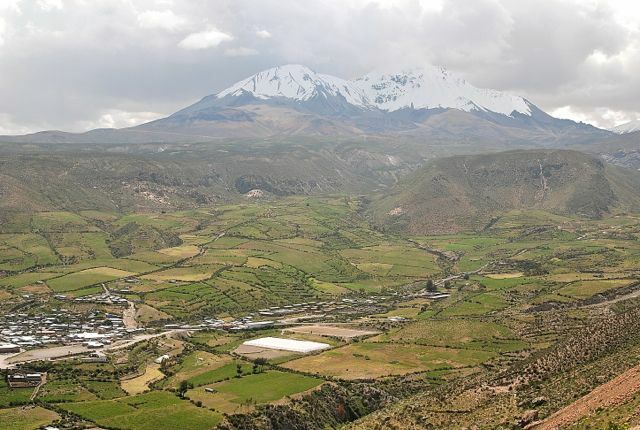 Most visitors spend a night in Putre, where the climate is mild enough to grow basic crops like potatoes and alfalfa, before continuing to the park, where altitudes are nearly 1,000 meters higher. I’m spending two, partly because I was concerned enough about my health to bypass the higher altitudes this time, and partly because the international highway to Bolivia, which passes through the park, is undergoing repairs and experiencing major traffic delays. 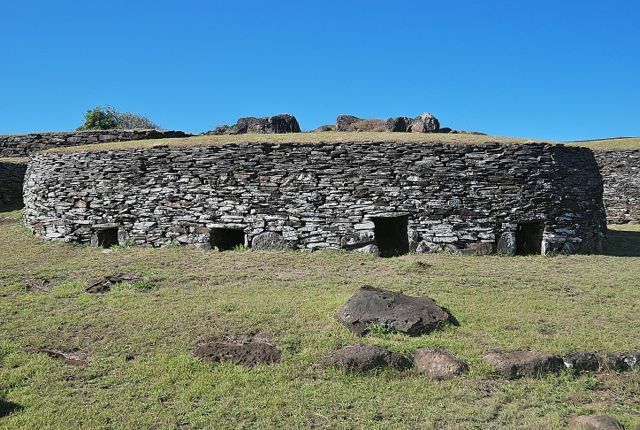 In fact, on arrival in Putre, I felt a notable dizziness as soon as I parked the car and walked around the village in search of lunch. 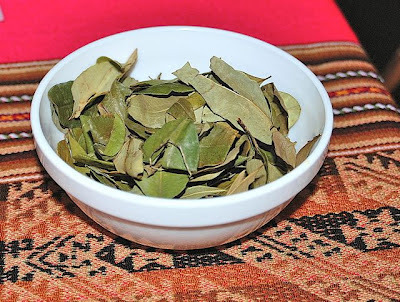 Fortunately, I quickly found the Kuchu Marka pub, where I barely nibbled on a mediocre midday meal but, more notably, drank two large cups of mate de coca, an infusion made the notorious coca leaf (pictured below). 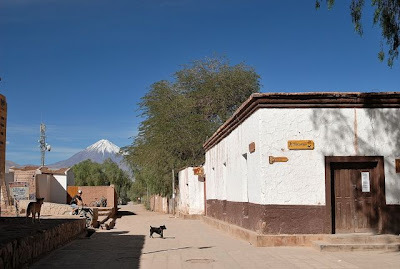 In principle, the coca leaf is illegal in Chile but, in reality, it’s tolerated in small quantities, especially in small communities like Putre, most of whose inhabitants are indigenous Aymara people. 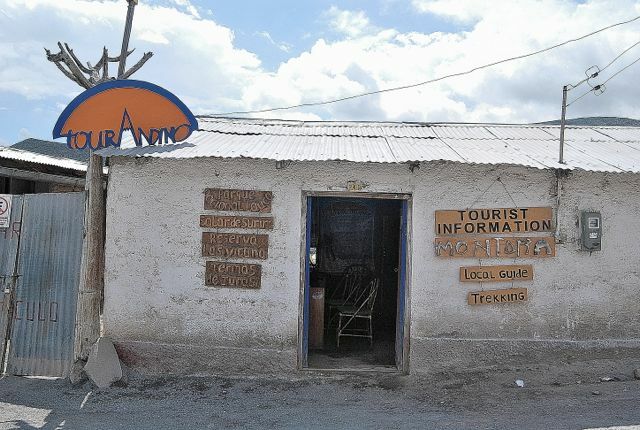 It’s a well-known remedy against symptoms of altitude sickness. 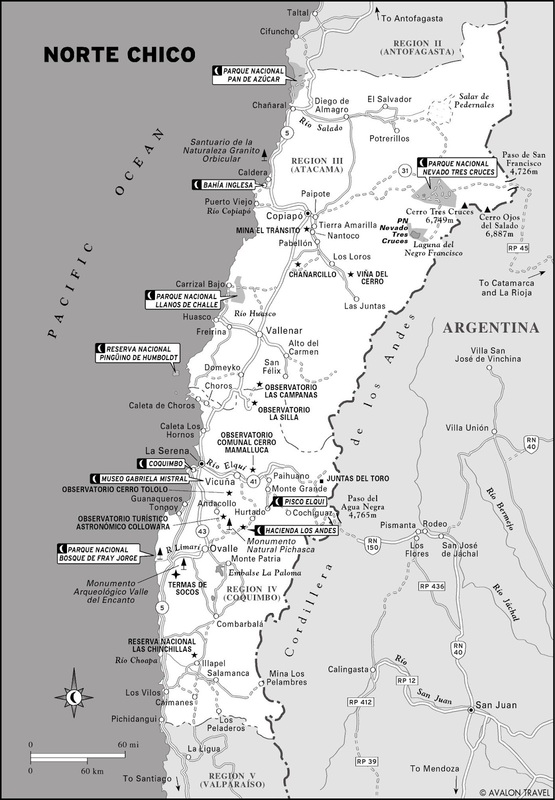 When I first visited Putre, in 1979, the only accommodations were a simple refugio operated by Conaf, the agency in charge of Chile’s national parks. 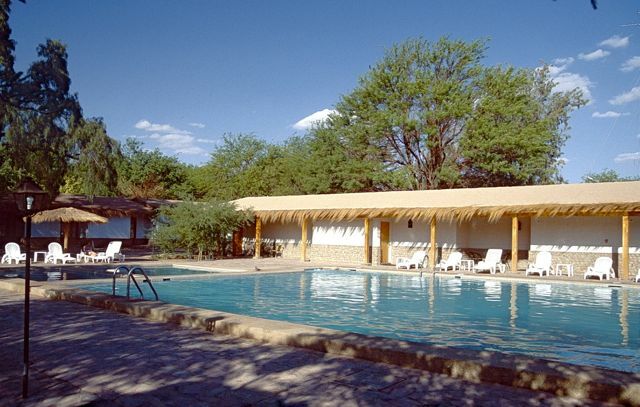 Today, if not quite unrecognizable, it’s dramatically changed, what with stylish accommodations like the Italian-run Terrace Lodge and the Aymara-operated Chakana Mountain Lodge (pictured below, owned by the founders of Talca’s Casa Chueca). 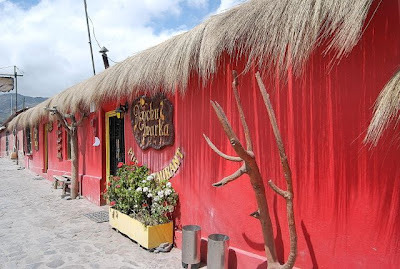 Kuchu Marca, which set the pace for Andean cuisine a few years ago, has declined, but Cantaverdi has taken up the slack, as the best place in town to get a well-grilled llama steak. Several Putre-based agencies run day trips and longer excursions to the park, with its snow-topped volcanoes, spectacular bird life in its deep blue lakes and lush marshes, and herds of wild vicuñas. The village also has modern services, including cell phones and easy Internet connections, and even a new ATM at its BancoEstado. Compared with three decades ago, it’s enough to take your breath away – in which case you may need another infusion of mate de coca. South America has two of the world’s greatest river systems: the Amazon, which drains several different countries before emptying into the Atlantic in Brazil, and the Río de la Plata (River Plate), which enters the South Atlantic between Argentina and Uruguay. In the interests of chauvinism, though, Argentine domestic trade secretary Guillermo Moreno recently tried to do away with the Amazon. Well, at least with Amazon.com. 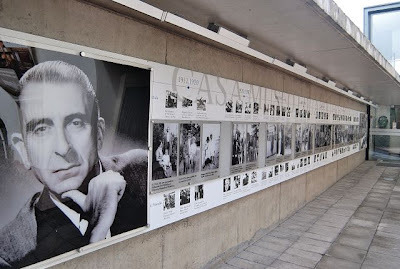 In a notorious case some months ago, a Spanish author on a Buenos Aires speaking tour was unable to get his books out of Argentine customs because of an arbitrary ruling that, if I recall the gist correctly, requires foreign countries to accept an equivalent amount of Argentine exports for every import – whether or not there’s a demand for those exports. Obsessed with surging imports and capital flight, the government has employed dollar-sniffing dogs at airports and borders crossings, and even restricted Argentines’ ability to use their ATM cards outside the country. 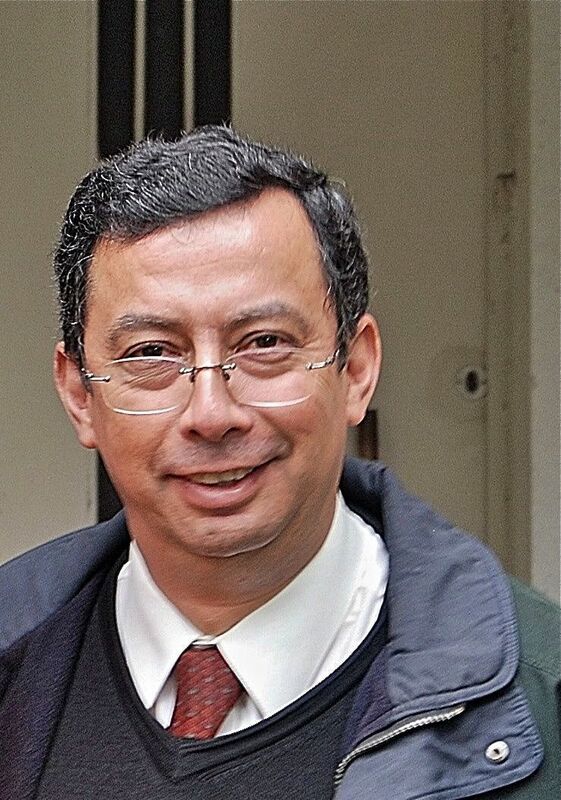 Apparently such measures seemed inadequate, so Moreno – who became (in)famous for brandishing a pistol at a meeting with soybean farmers who came to plead against what they considered punitive export duties – recently decided to focus on books. In principle, any Argentine could order an individual book from Amazon or another online reseller to bypass import restrictions but, for Moreno, that was a challenge. Thus came to be a trade measure decreeing that anyone who ordered such a book, presumably paying by credit card, would have to pick up that book in person at Buenos Aires’s international airport at Ezeiza – even if he or she lived in Tierra del Fuego – and pay a premium of as much as US$80 for the privilege of doing so (I sure would like to have royalties on such a surcharge for every purchase of Moon Buenos Aires, Argentina, or Patagonia). According to Buenos Aires Herald columnist James Neilson, who dissected the issue with an irony that I cannot possibly match, Moreno claimed that foreign books were a health hazard because their ink contained higher lead levels than books produced in Argentina. Presumably, added the sardonic Neilson, poetry books deserved an exception because they use less ink. Later in the week, though, according to Herald columnist Martín Gambarotta, Moreno finally rescinded the measure, and Argentines are once again free to launder their pesos abroad on foreign literature. The saga may not be over, though. This coming April 19th is the opening day of Buenos Aires’s Feria del Libro (pictured at top), the continent’s largest book fair, attracting hundreds of thousands of avid readers over a three-week period. 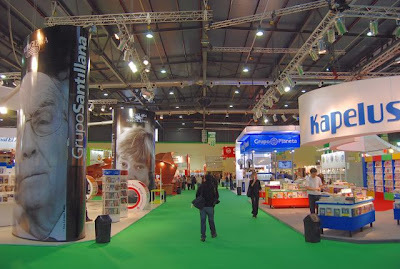 As usual, numerous foreign publishers and authors, including several from the English-speaking world, are due to participate - but who knows whether or not Moreno will let them get their merchandise out of customs? The erratic trade policies still apply to other goods, in any event. The CEO of Telecom Argentina was recently quoted to the effect that the easiest way for an Argentine to purchase an iPhone would be to travel to Miami - Moreno has prohibited their sale in Argentina because Apple does not manufacture the devices there.